Chris Avalos cameback from the defeat after beating the Filipino foe Rey Perez in Texas Today, August 1, 2015. Chris Avalos scores a dominant win in the fight, he was unstoppable and showed that he is better fighter. 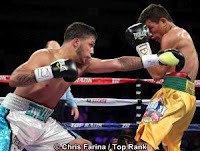 Avalos regained and improved his record with 26 wins including 19 wins by way of KO and has 3 defeats, while the Filipino fighter dropped his record with 20 wins with 7 losses. Avalos won the fight via 80-72, 80-72 and 79–73 unanimous decision.